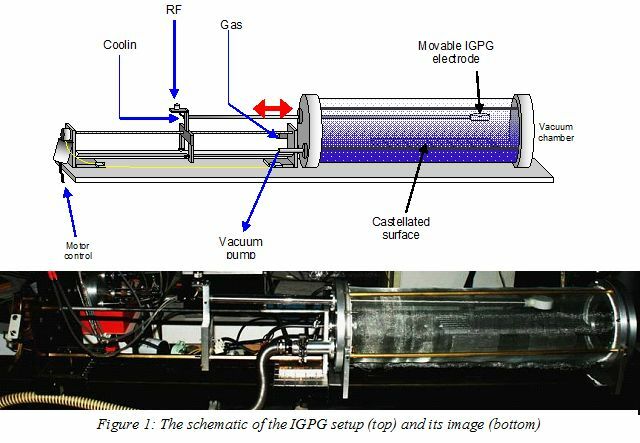 The IGPG (Inside Gap Plasma Generator) consists of a water cooled movable electrode, mounted in a vacuum chamber, which can be placed at various distances from the castellated surface. The main part of the set-up is the discharge chamber, provided with two electrodes facing each other at a distance of 60 mm. One of the electrodes, the powered RF electrode is shaped like a disk and is covered in upper part with a Teflon cover. The role of the cover is to prevent the discharge to burn behind the powered RF electrode. The other electrode is a grooved piece with narrow grooves of variable width. A schematic view and an image of the IGPG setup are presented in Figure 1. In Figure 2 are presented images of the plasma operation with the electrode placed in the front of a castellated surface. It should be noticed the formation of the plasma column in front of the electrode and the penetration of the discharge inside the gaps. During the experiments it was checked out that the electrode, the plasma column and the contact area of plasma column with the surface move all together, like a mobile “plasma shower”, while the plasma remains penetrating inside the gaps. Castellated pieces which can be mounted and dismounted from separate parts were designed and machined. The parts consisted of optical polished aluminum cubes and were vacuum coated by Plasma Assisted CVD. The coating thickness was measured by Atomic Force Microscopy and ellipsometry. It was 1.2 mm. An image of the cubes, the uncoated and coated castellated surface appears in Figure 3. The assembled coated castellated pieces were submitted to cleaning by IGPG in conditions of discharge generation inside the gaps in a mixture of 94% argon with 6% air, at a pressure of 27 mbar and 50W power. After cleaning at various times, the castellated piece was disassembled (see Figure 4) in cubes. Experiments were performed in order to check the possibility to control the development of a radiofrequency discharge inside gaps with various widths. We have shown that by gradually modifying the radiofrequency power forwarded to plasma and the discharge pressure it is possible to create and maintain the plasma inside narrow gaps for well defined domains of the pressure-power parameter space. The cleaning process is favored by plasma presence in the proximity of the surface to be cleaned. Cleaning experiments were performed on castellated surfaces having rectangular gaps 1.5 mm in width and 6 mm in depth, coated with hydrogenated amorphous carbon layers. Comparing to the frontal surface exposed to plasma the cleaning process is faster on the inside gaps surfaces, probably due to a hollow electrode type process enhancement. Also, the cleaning process is faster at the edges, as example at the gap entrance. Experiments with a movable active electrode have proved that the plasma column size and its contact area moves over surfaces, like a movable “plasma shower”, while the plasma remains penetrating inside the gaps. This result has relevance for cleaning of large nonuniform surfaces which present defects, holes, or gaps.